An ARISS educational radio contact is planned with Bischöfliche Schule / Technisches Institut, St.Vith, Belgium, and Berufliche Schule Direktorat 1 Nürnberg, Nuremberg, Germany telebridge via W6SRJ. 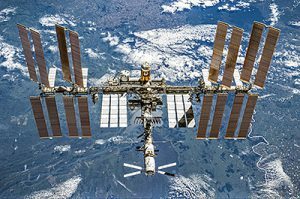 The ISS callsign is presently scheduled to be OR4ISS and the scheduled astronaut is Alexander Gerst KF5ONO. Contact is a go for: Fri 2018-09-21 10:15:22 UTC 44 deg. Downlink signals from ISS will be audible over parts of USA on 145.800 MHz narrowband FM; conversation will be in german. Credit: AMSAT. Any informations about this radio contact are welcome! 1. What is your view on planet earth or the stars like? 2. We are a vocational school for metal and electrical engineering and learn much about electric current. Is the behaviour of electric current differently than on the earth? 3. What does your daily routine look like and what about your sleep pattern? 4. What is the most thing you miss during the time in space? 5. Can you compare your body sensations of weightlessness in the confined space of a space station with your body sensations on earth? 6. If somebody of your crew has birthday, is there any birthday party on the ISS? 7. Is it more difficult to get exercise? 8. We have seen that the ISS crew is an international team. Which time zone you use on board? 9. What does your food mainly consist of and do you like it? 10. What has to be done if an astronaut suddenly gets ill? 11. What is the air you breathe like in the station? 12. What fascinates you particularly on amateur radio? 13. For how long do you have daily internet access? Can you use it for private needs such as staying in touch with your family and friends? 14. Is it possible to see bigger towns like Nuremberg from space? 15. What are you doing research on at the moment? 16. We have read that astronauts must exercise at the sojus-simulator. How much driving lessons are necessary to park a Sojus capsule? 17. Which was your most interesting experiment? 18. What do astronauts do in their leisure time? 19. Are there any findings which could have an impact on our daily lives? 20. We have seen the space photos of Alexander Gersts last mission at school. Is there any chance to see new photographs?